If you have a taste for fine wine, it’s understandable that you would want to show off your collection. However, if you’re limited in terms of space, it can be difficult to achieve this. Fortunately, our love for design goes hand in hand with our love of fine wine, so we’re always enthusiastic when customers want to find innovative ways to showcase their collections. While it can sometimes be a difficult task to find the space to effectively showcase your wine collection, with just a hint of creativity, it is possible. 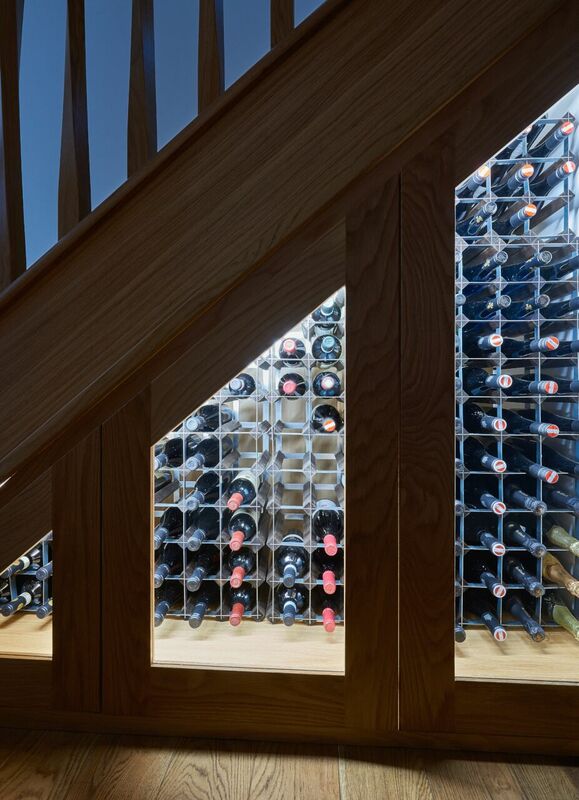 As specialists in staircase design, we’re able to utilise the often forgotten space under your stairs to create the perfect storage solution for your wine collection. 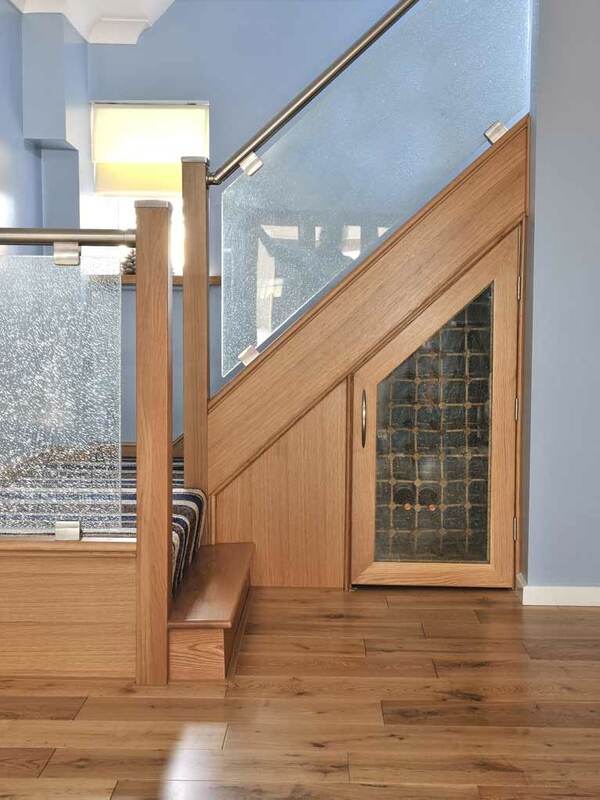 Here, we explore some of the bespoke wine storage solutions we’ve created using the space available under the stairs. A while back, Mr and Mrs Russell approached us to help them create the staircase of their dreams. From the first meeting with them, it was clear that storage was a specific consideration of theirs, and the idea of an integrated wine cabinet beneath the stairs was floated. The integrated wine cabinet provides a great talking point for guests, and the glass doors allow the Russell’s to effectively showcase their impressive selection of wines. By creating a bespoke wine cabinet under their stairs, the Russell’s have modernised their home whilst adding a certain wow factor to their hallway. Plus, it’s a great way to impress guests at dinner parties. Who needs fancy wine bars when you have your own custom collection and signature design feature within your own home? Read Mr and Mrs Russell’s customer story. Another recent customer of ours, the Armstrongs, were looking for ways to maximise the space under their stairs, and as the couple had links to a winery in Italy, it was a no-brainer. The Armstrongs were very excited about being able to utilise the space while also showing off their enviable wine collection. Understandably, they wanted to make it a real feature within their home. The wine cabinet is built into their modern wooden staircase, which acts as a central focal point in the entrance hall. By showcasing their wines, the Armstrongs have given the room an additional function, which adds both character and style. Read Mr and Mrs Armstrong’s customer story. If you want to maximise the space under your stairs and create a bespoke wine storage solution, get in touch to see how we can help.